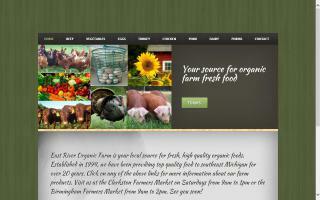 East River Organic Farm is a small family farm dedicated to providing fresh, organic food to the surrounding community. We are a locally owned and operated business committed to environmentally sound farming practices. We have employed organic farming methods since 1994 and are certified organic with Indiana Certified Organic. As of 2012, reported offerings include: organic products, baked goods, crafts, flowers, eggs, herbs, vegetables, honey, jams, maple products, meat, nursery plants, plants, poultry, and soap.